Simplicity and looking hot is okay but the stress you take to attain that can really sometimes go wrong. Where saree is the top notch traditional attire, other essential like blouse, petticoats and even under garments take a special place to make you look absolutely perfect. Blouse designs and patterns or saree works and colour combinations are the external factors which take 99.9% of compliments. But do we really applaud for the whole one? Generally we ignore them because they hardly matter to us or our whole attire. Think again then! Besides the doll up look of your blouse and saree, petticoat acts as a frame to the whole ethnic garm. And your entire look depends on the type of saree petticoat because the shape and fall are given by it. Now say no to tight drawstrings and undefined shapes. Here comes saree shape wears which are the suitable replacements of classic petticoats. These numbers have soft streamlined fabric and excellent waistband which perfectly holds saree at its place. Don’t worry about saree pleats, it will stay in position. You won’t get any extra compression at your stomach and for the same reason slimming effect is now possible. Try it now with your best designer saree. When you are talking about the sarees for women, you can always expect vivacity in its designs and styles. If it is a casual occasion or an event which welcomes fashion fads then you can go with tight pants replacing those classic petticoats. 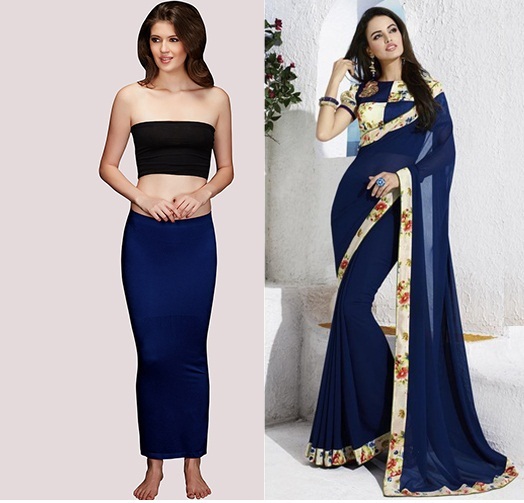 Make sure that the colour combination of these pants and sarees are little bit contrasting or different. Wear simple pearl choker with this designer attire. Now come back to the classics babe! Opt for these flared or pleated saree petticoats when your online designer saree is of cotton or fabric which is slightly stiff. These petticoats give a firm position to your desi style sarees. Nowadays people are falling for contrasts and changing hues. Do you also? Well if you love to experiment with colours then this must b your genre. Try dark shades as your inner garment and let your saree fall be light. The dark colour of the petticoat will impose a mysterious impact on the plain sarees. Try it once and don’t forget to share your diva experience.